You are here: Home / Blog / Cosmetic Dentistry / She loves coming to her dentist in Cancun! Our dear patient Mary got a wonderful smile makeover with crowns with her dentist in Cancun, Mexico. Experiences like these is why we love doing what we do. We get to see people smile again when they thought they never would. She’s been coming for a while now for check ups and to make sure everything is ok. We provide a thorough customer service for our patients with phone calls and quick email responses. In fact, we have won de WhatClinic service award because of our excellent record. Dental tourism in Cancun is really one of the best solutions to save up to 70% on your cosmetic dentistry. Let your dentist in Cancun evaluate your case and give you all the possible dental treatments you can get. I first came to the clinic two years ago because, I didn’t have anything major wrong with my teeth but, they’re getting old and they were crooked, they were chipping, they were wearing away, they were discolored and, I have several friends that have come to the clinic here before and they were so happy! Okay, my name is Mary L. I’m from Duluth, Minnesota, we left yesterday to come down to Cancun, and we left in the middle of a snowstorm, it was snowing and kind of sleeting and everything, and we arrived in beautiful Cancun to, I think 88º degrees yesterday, so that was wonderful! Two summers, or two springs ago, I came here and I had all my teeth crowned, I was so happy. They did do it fairly quickly, though and so that first year I had a couple of problems that I needed corrected, so I came last year and they took care of everything, they did a beautiful job, everything was covered under the warranty, there was no cost to me and I’ve just been so happy. This year I’m here only to have my teeth cleaned, so I don’t have any problems, I don’t have any pain, I… They’re perfect and I get so many compliments on them. It’s just been a pleasure being here at this dental clinic here and the staff, if it wasn’t for the staff I don’t know if I would be here today but they’re wonderful! And I’m gonna come here every spring to see the staff, have my teeth cleaned or have anything done I need to have done but Dr. German, Dr. Olivia, Dr. Victoria, Dr. Jesus were all here when I started. They started out with me, they would contact me all the time back home in Minnesota and they have made this just a pleasure for me, they’re wonderful, they’re kind, they’re gente and I feel like we’ve become friends, yes! Now, like I said I just got here yesterday so I get a full week of enjoying my vacation in beautiful Cancun! If you want to know more about a dentist in Cancun Cosmetic Dentistry can do for you call toll free from USA and Canada 1-800-565-1424, or if you are already on vacation in Cancun and want to meet us, you can call us for an appointment at the following local number (998) 1-40-51-25. 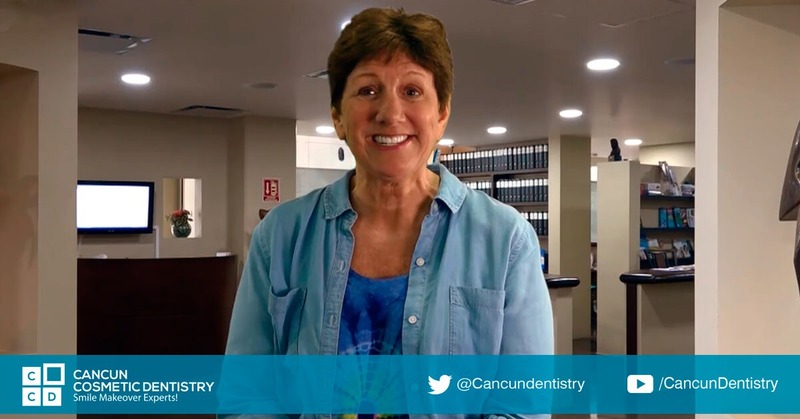 Patient review of dental work in Cancun Cosmetic Dentistry!